Asphalt shingles are the most popular roof covering for homes, largely because they are relatively inexpensive, are durable, and come in a wide variety of styles, colors, and textures. Here at Roofing101, we carry three-tab shingles and architectural shingles from leading manufacturers to give your home a long-lasting beautiful finish. We are your local asphalt roofing expert serving Overland Park, Kansas City, Independence and many areas of Kansas and Missouri. Call us at or click below to schedule your roof inspection and get a no-cost, no-obligation roofing estimate. "Colby, the salesperson was awesome. Roofers did a great job. Very happy." Colby, the salesperson was awesome. Roofers did a great job. Very happy. "Mike did a tremendous job showing us the damage and going over our..."
Mike did a tremendous job showing us the damage and going over our options. We chose you for your affordability and the fact that we trusted Mike. "Matt did an excellent job of following up and making sure everything had..."
Matt did an excellent job of following up and making sure everything had been completed and finished as asked. Very pleased with him! "Such a great company to work with!" Such a great company to work with! "We recently had our roof replaced by Dessert Companies and they made it so..."
We recently had our roof replaced by Dessert Companies and they made it so simple! My husband and I were having difficulty deciding on a color and they walked us through their recommendations based on our house color as well as what would look great to buyers when we decide to sell. The turn around time and install were very fast. They did a wonderful job and our house now looks a thousand times better! "Your crew were pleasant to have on our property, service in all areas was..."
"Very timely and excellent roof replacement"
"They were finished before I expected." They were finished before I expected. "Thanks so much, I look forward to possibly doing business with your..."
Thanks so much, I look forward to possibly doing business with your company again in the future. "Totally recommend Dessert Companies for your painting and roofing needs." Totally recommend Dessert Companies for your painting and roofing needs. "Graham and his team are very responsive and came through on short notice..."
Graham and his team are very responsive and came through on short notice and cold weather. Extremely satisfied with his service and support. After the evaluation and inspection Colby found that we needed to tear off one layer of the previous shingles and replace the entire roofing system. We installed Owens Corning Duration TruDef series in Aged Copper. A few counties in north Missouri received a hail storm the first part of November 2016, which affected a number of homes and businesses. A homeowner in the path contacted Dessert Companies for an evlauation and hail and wind damage was discovered and assessed. Our crew removed the old layer present and installed Owens Corning shingles in Estate Grey and box vents in Lomanco Bronze style. If you suspect you may have similar issues give us a call today for a free evaluation and estimate at (913) 306-7443 ! We removed the older shingles on this home in the Northland, and replaced them with Owens Corning TruDef in Driftwood leaving this home with a safe and beautiful roof for years to come! This home in the Northland received a new roof! The Roofing101 crew used Owens Corning Duration TruDef shingles in Driftwood. The new roofing system looks amazing! Older shingles were removed from this home and replaced with Owens Corning duration shingles in Driftwood, completed with pro edge ridge. Looks Great! Previous Layer of asphalt shingles were removed and no decking was necessary. We installed Owens Corning Duration series in aged copper to complete the look. Weather worn shingles were the cause for our inspection to this home. Our crew tore off the existing layer to this home down to decking and replaced it with Owens Corning Duration series in Summer Harvest. If you believe you have storm damage and would like to schedule a free inspection please contact Dessert Companies today! Owens Corning Oakridge shingles with the color of driftwood. Owens Corning Duration driftwood used to reshingle roof. Owens Corning Oakridge brownwood shingles used in roof replacement. One layer of previous shingles was torn off of this home in Kansas City, and we installed Owens Corning Duration TruDefiniton in Driftwood to replace it. This home in Overland Park, KS, had its roof replaced with Owens Corning Oakridge aged cedar. Owens Corning Oakridge driftwood shingles were used to redo this roof in Shawnee, KS. Owens Corning Duration shingles with ridge vent. Located in Lansing, KS, this home had its roof replaced with Owens Corning Duration brownwood shingles. We removed a wood shake roof, re-decked it with 7/16" OSB decking, and installed a new Owens Corning Duration Storm Impact Resistant Shingle color is Slate. Owens Corning Duration driftwood used to redo the roof. This older roofing system was simply worn and reaching its end on this home in Lansing. We removed all shingles to replace them with Certainteed Grand Manor in Stone Gate Gray and replaced their skylights. This home now has a dependable roofing system to last them for years to come. Removal and replacement of one previous layer. We installed Owens Corning Duration Shingkes in Quarry Grey. Beautiful! This house had its roof replaced with Owens Corning Duration oynx blue shingles. Owens Corning Duration Storm Impact Resistant shingles in the color of estate gray used to redo roof. We tore off the older weather-worn roof down to the deck. This home in Lansing, KS received Duration TruDef shingles in Onyx Black and was completed with Weather-lock ice & water shield ensuring its life years down the road! These homeowners were in need of an evaluation to replace their older weather worn roof. After inspection the details were worked out and we removed and replaced the guttering and roofing ystem here. The roof was completed with Owens Corning Duration TruDefinition in Onyx Black. The previous layer of shingles was removed on this home in Leavenworth and was replaced with Owens corning Duration in Merlot. Great new look! Removal of 1 previous layer and step flashing installed. 7 box vents were also installed with the Owens Corning Duration shingles in Driftwood to complete this great roof on this home. This homeowner had a weather worn roof and was needing to have it replaced, as well as a few more items that needed repairing. We were able to install Owens Corning shingles in Estate Grey completed with WeatherLock Flex and leave this family with a beautiful home for years to come. Our trained, experienced roofers make sure that each shingle is nailed down properly to prevent blow-offs and roof leaks. In addition to asphalt shingle installation and repair, we also service a wide variety of roofing materials and can handle all types of roof repair, new roof installation and re-roofing jobs. Contact us today for a free estimate for the roofing services you need. 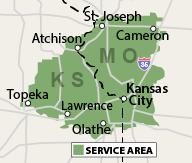 We proudly serve Topeka, Olathe, Lees Summit, Saint Joseph, Blue Springs, Lenexa, Shawnee and nearby towns and cities. Dessert Companies is an independent contractor and is not an affiliate of Owens Corning Roofing and Asphalt, LLC or its affiliated companies. THE PINK PANTHER ™ & © 1964-2019 Metro-Goldwyn-Mayer Studios Studios Inc. All Rights Reserved.